A couple of weeks ago we were wandering around the Parsons Green area in search of a coffee. Near the station, was a small shop front with a familiar name. Not quite a chain, but the logo of Shot Espresso is well known to me from its relatively new outlet in Victoria. 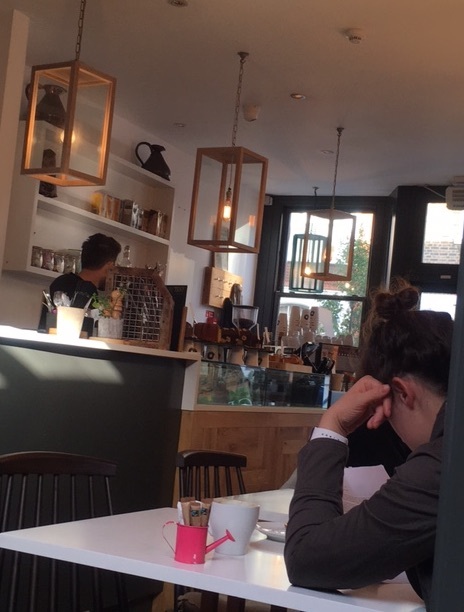 It turns out that the Parsons Green branch is one of four outlets for Shot Espresso which started just around the corner in Fulham. The staff were very friendly and took our order before we found seats at the back of the café. Although there was plenty of seating near the counter it was all taken, clearly this is a popular haunt on a Saturday afternoon. This did mean however that we found a cosy table in a small but very bright area, almost like a mini-conservatory. It seems we often have a long black and a soy hot chocolate and today was no exception. The hot chocolate was apparently perfectly well done my long black was fruity and drinkable, offering a perfect flavour backdrop against which to appreciate the area of the café. Then a tricky decision. Ordinarily, I am not a fan of reviewing chains (though there is a question, does four branches equal a chain or not?). I’m a great fan of what an independent coffee shop can bring to an area, a place where the owners can be found behind the counter and you can really get to know a friendly space. However Shot Espresso is not that large a chain and the branch at Parsons Green had the feel of a local. The staff when we were there certainly took an interest in the running of the shop and, another factor in my decision to review, there were so many things to notice here. Infinite tables? The logo on the table next to us at Shot Espresso Parsons Green. 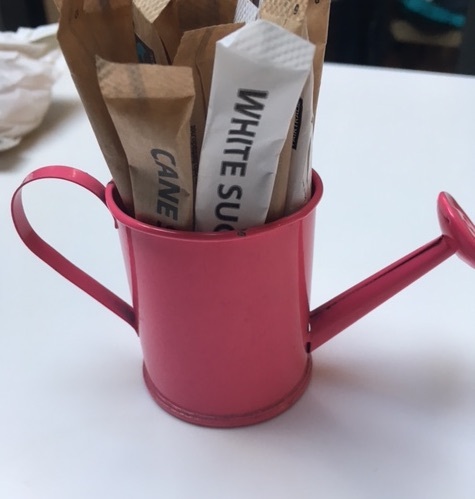 You have a mug of coffee, a cup of hot chocolate, a doughnut and this watering can on your table. Which is the odd one out and why? If you answered the watering can, you would have been correct. Topologically the mug of coffee, cup of hot chocolate and the doughnut are the same whereas the watering can is quite different. What does that even mean? It means that in terms of shape, a doughnut can be morphed into a coffee mug which can clearly be morphed into a tea cup as they each have one hole through them. The watering can however has multiple holes, not just to hold it and to let the water out but also, in this ornament design, at the join of the body to the spout (look carefully). This means that there is no way that you can transform a watering can into a doughnut, they are different categories of shape. 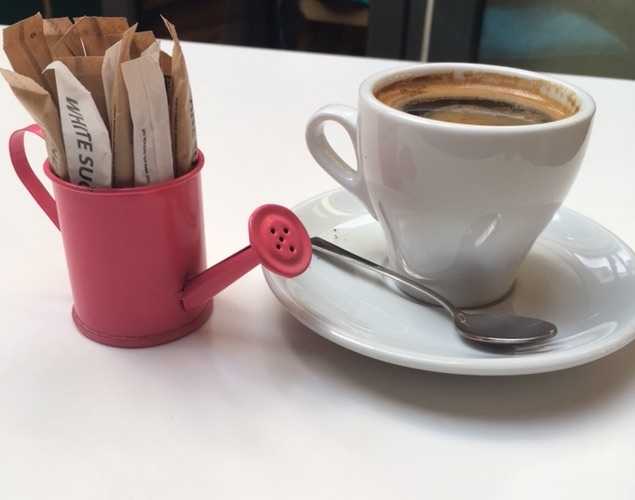 A coffee cup and a miniature watering can. But which has more in common with a doughnut? This field of mathematical study (which is known as topology) has, in recent years, taken on enormous significance to physics in terms of understanding some odd effects including the way that some materials conduct electricity (or not). Indeed, it has become so important that it was the subject of the 2016 Nobel Prize (you can read the citation here). And yet, even for someone who works in solid state physics and should have a mathematical background, trying to get my head around this subject is extremely difficult. Which got me thinking about something similar. When teaching, it is sometimes apparent how much mathematics appears as if it is another language. And in parallel with language, it requires a fluency to appreciate its beauty. And further, even with a fluency, to appreciate some use of the language requires more than just fluency but immersion, a concentration, an attention to the words. Perhaps an analogy is needed. Although fluent in English, I do not usually immerse myself in reading it. Consequently, I find the poetry of John Betjeman amusing and ‘readable’, but the poetry of Gerard Manley Hopkins very difficult. With patience, and advice from others, occasionally I can gain a flash of insight into a poem of Hopkins and realise the brilliance of the language but more often I struggle. What I would never imagine doing is saying “I can’t read English, I was never good at it in school”. And it is here that it seems to me the parallel with mathematics ends. For while we can have fun with algebra, understand some of the beauty in calculus and perhaps struggle with topology, we nonetheless seem happy in our society to say “I can’t do maths, I was useless at it in school”. We accept boasts about mathematical illiteracy when we would blush to say similar things about our native language (whether it is English or another language). A closer look at the watering can. The number of holes in the join to the spout would make this useless as a plant watering device. Surely there are few who are genuinely mathematically illiterate, at least, not to the extent that it is ‘boasted’ about within society. Indeed, you find many who are happy to admit that they don’t “do” maths, actually just mean that they would prefer to use their phone to calculate something. Just as with a spoken language, the language of mathematics requires practise. For it is practise that allows us to appreciate the fun of mathematics just as it is practise that allows us to read poetry. Why do we deny ourselves the fun of a language because it is fashionable to admit illiteracy in it? If you would like to push yourself with some mathematical poetry, you can read about topology, coffee and doughnuts here or in more detail here and more information on the 2016 Nobel Prize can be found here. In the meantime, if you see something mathematically beautiful in a café, please do share it, either here in the comments, on twitter or on Facebook. Enjoy your coffee, tea or doughnuts. I too have never understood why some people seem proud of their inability to do mathematics. I wonder if it’s an inverse shame: they are, in fact, embarrassed about it, so make it a boast to cover the fact. Either way I shall have to check out Shot Espresso at some point.